When it comes time to purchase your next car, it can definitely be an overwhelming process. Car dealerships often try to throw jargon at you in order to convince you to buy a car that's not right. Ultimately, what you want is simple: you want a vehicle with the features and style that fit your needs, at a price point that you are comfortable with. Here at Certified Autoplex of Carrollton, just outside of Dallas, we work to simplify the car buying process by highlighting various used models in our inventory, so you can easily find the right vehicle for you. Here, we will be giving you the rundown on the Chevrolet Traverse. Chevy has long been known as one of the most reliable American-made car brands, and the Chevy Traverse SUV is definitely no different. Designed with performance, comfort, safety and convenience in mind, the Traverse is a great family vehicle for a number of reasons. Let's take a closer look at our available Traverse models and their features. If you are in the Carrollton or Dallas area and are already considering a used Chevrolet Traverse, follow this link to our inventory. We currently have four available models of the Chevrolet Traverse in our inventory, of which two are from 2016 and two are from 2017. The 2016 and 2017 models both share a lot of great features with a variety of uses. Let's take a closer look at the features of the Chevy Traverse. In terms of vehicle performance, the Chevy Traverse was built to impress. The 3.6L V6 engine, which comes standard in this SUV, generates up to 288 horsepower. With this impressive power, it is no surprise that it can tow up to 5,200 pounds, which is one of the highest towing capacities in its class. Additionally, the 6-speed Tiptronic automatic transmission, electronic stability system and more will all give this vehicle incredible handling. Additionally, there are numerous great safety features in the Chevy Traverse that can give you the confidence you need to go out safely on the road. Technologically, there are great features like available forward collision alert, rear cross traffic alert, rear vision camera, available rear park assist and much more. Mechanically, it has an available front center airbag and a high-strength steel safety cage. Finally, the Chevy Traverse was designed for optimal space, both for seating and cargo storage. This vehicle has comfortable seating for up to 8 people, and incredibly versatile seats that can fold in different configurations for up to 116.3 cubic feet of total storage space, including 24.4 cubic feet behind the third row. 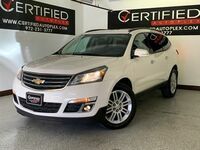 Interested in a Chevrolet Traverse?